The receive converter consists of tree main elements, Low Pass Filter to mitigate strong AM broadcast band transmission over loading the receiver, a single transistor amplifier and Ring Mixer to step the 630m band (472kHz-479kHz) signals up to the 30m band frequency range of 10.472MHz-10.479MHz. While 472kHz-479kHz is the range of interest for this project the receiver converter is well capable good reception well below these frequencies. Fig 1 Schematic of the receive converter. This circuit is subject to further development. Photo 1 Assembled receive converter. With the 630 metre band being so close to the AM broadcast band it necessary to provide a low pass filter to attenuate potentially strong signals that may desensitise the receiver. AADE Filter Design 4.5 was used to design and analyse the receiver's low pass filter stage. Fig 2 AADE Filter Design 4.5 attenuation analysis of the receiver low pass filter circuit. 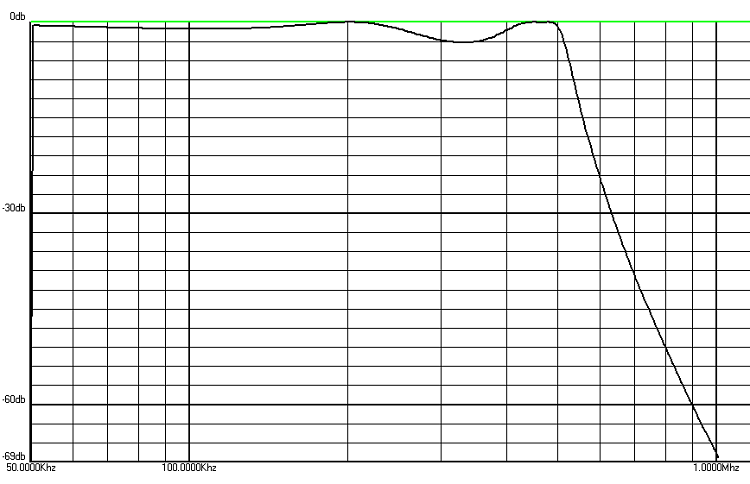 The real world filter circuit assembly was testing and exhibited an attenuation curve approximately 25kHz higher in frequency as compared to the model. See Fig 3. The higher cut off frequency of the low pass filter was surprisingly high as the AADE Filter Design 4.5 application had generally provided fairly accurate modelling of similar filters, however the resulting low pass filter performance is sufficient for the proposed receive converter. The variation in modelling when compared with the physical circuit performance may be a result of the use of the cheaper Epoxy Dipped RF Radial Chokes. Fig 3 Low Pass Filter attenuation measurements graphed with excel.